One of the guys who makes the blogand, and who calls himself Thudlike, had his house burned down in 2000. 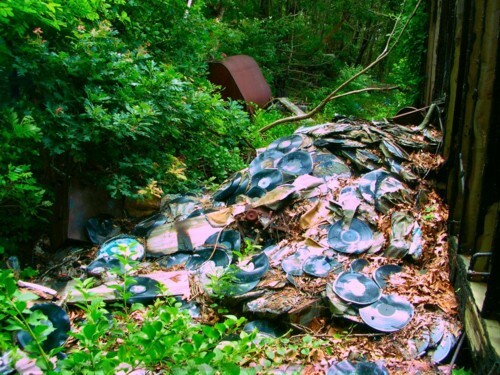 His complete record collection, the result of years and years dedicated crate digging, was lost. He writes that only one record survived the fire intact: a Barry Manilow picture disc. I was shocked to see the pictures. 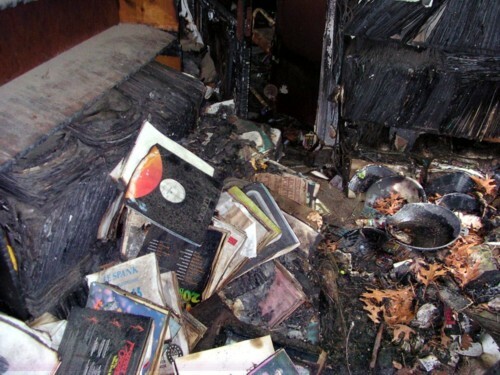 This is the first time I see the leftovers of a record collection after a fire. I often think about what my reaction will be when something like this happens to me. Of course, my record collection is not that interesting. I think I would miss my own writings most of all. I probably can re-write most of it, but that would take the rest of my life, and I actually have other plans with the rest of my life. I think a lot about the end, dead, loss and related subjects. I use these thoughts an advisor. It helps me from getting too involved in whatever I am doing. As the Buddhists say: all things are impermanent, and if you don’t reckon with this fact, you are bound to end up sad and bitter. I don’t want to end up sad and bitter. The guy who saw his record collection go up in flames is not bitter or broken. It felt good to read that. I collect stories of people who deal with loss in ways that I find inspiring. Eliasabth Kubler-Ross, a German woman that worked with dying children for most of her life, and who wrote several fascinating books about her experiences and insights in this subject, discovered a ”law” . It is now called “the law of Elsiabeth Kubler-Ross” , and it says that ”anything that you loose will be replaced by something better” . The difficulty is to recognise whatever replaces what you have lost. Many people cannot recognise it, or cannot accept it. In one book Elisabeth Kubler-Ross tells that a dying child told her that death was nothing to worry about, because ”dying is just like walking into your mind.” This made an enormous impression on me.